The days are getting longer and the birds are starting to chirp, and finally the mountains of snow are starting to disappear. Soon it will be time to hit the open waters of Lake Michigan again in search of salmon & trout. After drastically different salmon fishing seasons in 2012 and 2013, many things are left in question. Anglers from East Chicago to Frankfort, and everywhere in between are wondering “what will the 2014 fishing season bring?” While no one knows the answer for sure, we will do our best to gaze into the crystal ball. Before we look to the future, let’s take a look back and try to understand the past 2 seasons. The 2012 salmon fishing season started with a definite bang. The unseasonably warm winter and spring led fishermen onto the lake much earlier than normal. King salmon showed up in the southern part of the lake in March and in central and northern ports in early April, well over a month ahead of their normal arrival. Fishing for kings was fantastic nearly all season long from ports all across Lake Michigan, and the weather continued to be favorable, with warm temperatures and onshore winds. Charter boats reported frequent limit catches, often twice a day, nearly the entire season. There was no lull in the action until mid-September, when the majority of mature fish ventured up river to spawn. Simply put: catch rates in Michigan were higher than they had ever been in the 47 year history of the Lake Michigan salmon fishery. The only drawback was the size of the Chinook (king salmon). The majority of the fish were in the 14-18 pound range; very few fish eclipsed the 20 pound mark. 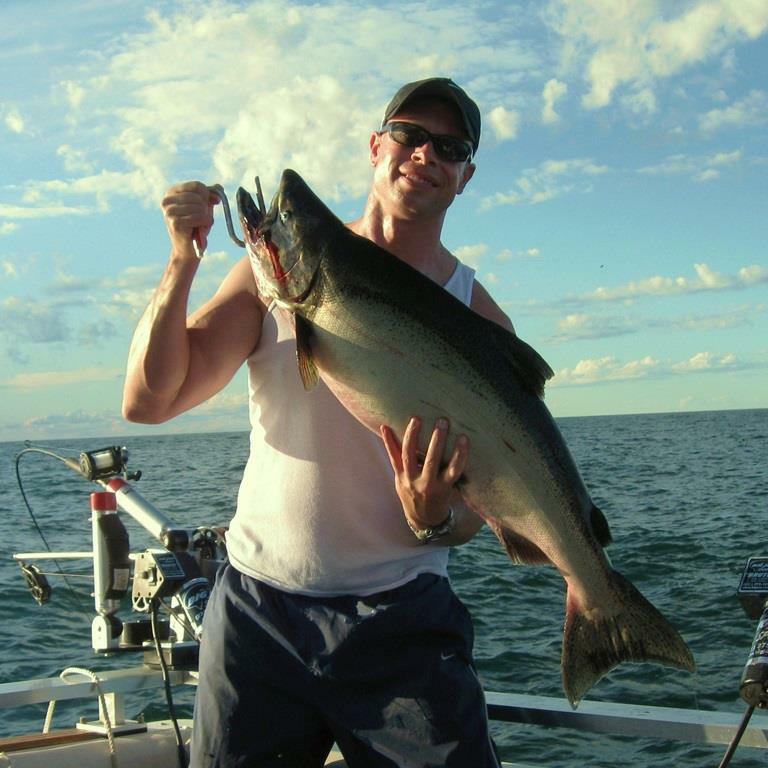 In fact, 2012 was the first season ever where no king salmon were entered in to the Michigan Master Angler Program. In order to be entered a King salmon must be 27 pounds or greater if kept, or 39 inches or longer if released. Coming into the 2013 season hopes were high, with memories of 2012 not far in the rear-view mirror. But a warm and advantageous spring weather pattern never materialized. The lake temperature stayed cold much longer than normal and both King and Coho Salmon were very scattered and lethargic, even in the extreme southern ports. Savvy charter captains had to rely on the Lake Trout fishery to satisfy their clients, while waiting for the salmon fishing to bust loose. But that explosion never truly materialized. Catches of king and Coho salmon came in spurts and never quite in the numbers of 2012. The cooler weather made finding warm, active water more of a challenge. There was one striking improvement though. The size of the king salmon was nothing short of phenomenal. Chinook salmon topping 20 pounds were commonplace by mid-May, despite being a near impossibility less than a year prior. Reports of massive, albeit scarce Chinook were the talk of most coastal fishing communities. When all was said and done, 124 Chinook salmon were registered in the Master Angler Program, which was the most in the state since 2001. Some of the biggest fish of the season weighed in at nearly 36 pounds. The fish pictured to the left tipped the scales to 31 pounds 14 ounces. What a change in just one season. As the adult salmon headed upriver to spawn, there was one additional positive sign. Juvenile salmon, which had been mostly absent from the catch the majority of the season, began to show up in solid numbers during the fall fishing season. Here’s the real kicker: According to Mark Tonello of the Michigan DNR, the freakishly abundant salmon in 2012 and the giant tackle busters of 2013 were from the same year class! The 2010 hatch of Alewives (the primary forage of Lake Michigan salmon) was abundant and thus contributed to an exceptional hatch of Chinook salmon that same season. 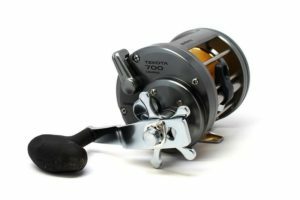 This, in turn, carried the king fishery for 2 seasons. The state of Lake Michigan is constantly in flux with the introduction of new species into the food chain, variations in weather patterns, and the ebb and flow of the lake’s water levels. The salmon fishery relies heavily on a balanced predator-prey relationship, mostly between the Chinook salmon and the alewife populations. If salmon become too abundant, they will literally wipe out the Alewives lake-wide; similar to what happened in Lake Huron a decade ago. Biologists and managers are working diligently to avoid this and sustain the fishery well into the foreseeable future. Because of this, salmon plantings were cut 50% across the lake, with Michigan taking the bulk of the cuts, reducing stocking of Chinook by 67%. “No further cuts will be done in 2014, we will still stock 559,000 Chinooks into Lake Michigan” according to Jay Wesley, the Michigan Department of Natural Resources southern Lake Michigan management supervisor. Although stocked salmon may be beginning to become the minority, as up 66% of Chinook in Lake Michigan are now believed to be naturally reproduced. Although there are certainly challenges, according to the Michigan DNR Lake Michigan Basin Coordinator Todd Kalish, there is plenty of promise. “I’m confident that we can manage a sustainable Chinook fishery for the long-term.“ he stated at a recent conference. What about fishing in 2014? After a long winter, with prolonged cold temperatures, the king salmon fishery may be slow to get going once again this season. Despite this, fisheries managers are expecting a better season in 2014 in terms of numbers of Chinook caught by fishermen. “This year we expect the size will be down (from 2013), but the catch rates will be higher” stated Wesley. The reasons for this are due to lower Alewife numbers, coupled with lower metabolism in the predator fish due to the prolonged cold temperatures. The colder water is also expected to have an impact on the size of other fish species as well, as the size of coho salmon and Steelhead are forecasted to decrease. As we continue to live off of the 2010 and 2012 Alewife hatches, the salmon will be less hefty, but more apt to strike a lure because there is predicted to be less available forage. This is certainly positive news from a fisherman’s standpoint. 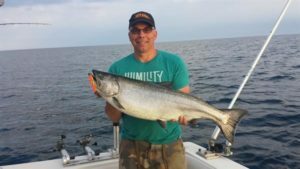 At the time of this writing, a few brave anglers have already reported great catches of coho salmon in southern Lake Michigan from Burns Ditch and Gary, Indiana. “Fishing for coho is aslo expected to be good throughout the season,” according to Jay Wesley. 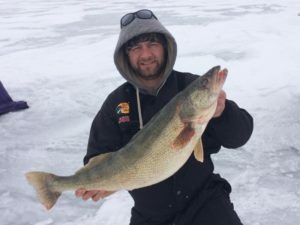 He also believes that because of the colder lake temperatures, those fish will spend a prolonged period in the southern portion of Lake Michigan. Traditional ‘hot spots’ for these fish are St Joseph & New Buffalo, Michigan along with Michigan City, Indiana. All things considered, Lake Michigan salmon fishermen should see somewhat of a balance between the previous 2 seasons in 2014, in terms of size and numbers. And I believe that is exactly what most anglers would like to see. As the sun continues to shine more each day, it is just matter a time before the drags start singing again.